Often imitated; never duplicated! 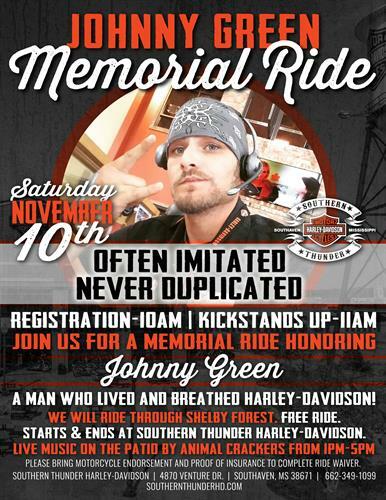 Join Southern Thunder Harley-Davidson for a free memorial ride honoring Johnny Green! Johnny Green was a man who lived and breathed Harley-Davidson and is missed dearly. In his honor, we will ride from Southern Thunder Harley-Davidson and cruise through Shelby Forest and return to the dealership to enjoy live music by Animal Crackers. *Please bring motorcycle endorsement and proof of insurance to complete ride waiver.